Charity riders gear up from Göttingen to Cheltenham! Two directors will cycle from Cheltenham’s twin town Göttingen in Germany back to Imperial Gardens in Cheltenham covering 611 miles in just 7 days! Rob Adkins and Paul Berry, Officeworx directors, are supporting local charity County Community Projects who work within the community with projects, ‘Transforming lives by preventing homelessness, strengthening families and promoting independence’, and will set off today (June 21) in an attempt to raise over £2500 for the charity. Cordell Ray, chief executive of CCP said: “The Officeworx team have been, and continue to be, fantastic in the support they offer CCP. They always come up with very inventive ways to raise funds for the work of the charity. In previous years they have undertaken a cycle ride to Paris, supported our Seasonal Hamper Scamper appeal by donating food from their Elfie Selfie campaign and last summer they ran a sunglass ‘Sunny Selfie’ campaign. The income raised by Officeworx over the years has helped us provide valuable support for homeless young people, disadvantaged families and vulnerable adults. We are truly grateful for the support of such a great local business and wish Rob and Paul every success in their newest adventure”. Both riders will be waved off today, by the Deputy Mayor of Göttingen, Ulrich Holefleisch who is planning to cycle the first few miles with them. Rob and Paul will then follow a schedule beginning from our twin town Göttingen (by the twinning signpost) ending on day seven in Cheltenham (Imperial Gardens). Supporters can follow the duo’s cycling adventure on twitter using @officeworx #CCPBIKE17. 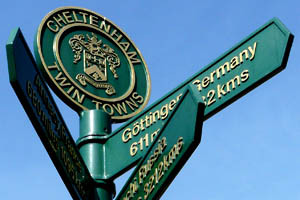 Mayor of Cheltenham, Klara Sudbury and Cllr Max Wilkinson will be welcoming Rob and Paul back by the twinning signpost in Imperial Gardens. Dave Jones Deputy Chief Executive of CCP will also meet the duo to help encourage them to cycle those last tiring miles. Cheltenham will host the finish of penultimate stage of the OVO Energy Tour of Britain this September at the Cheltenham Festival of Cycling, which will see the world’s top professional cyclists race through the Cotswolds to arrive in our historic spa town on Saturday 9 September.